Jake Guentzel celebrates his first NHL goal after scoring on his first shot during his first shift in the NHL. Jake Guentzel made his NHL debut last night against the team that drafted his father Mike Guentzel in the seventh round in 1981. 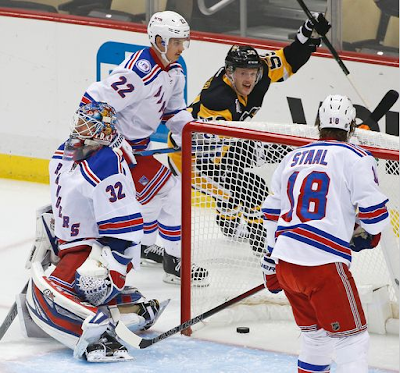 Jake Guentzel wasted no time in reinforcing his reputation for scoring goals during his first shift against the New York Rangers in PPG Paints Arena. On his first shift and first shot Guentzel lifted a puck over the glove of Antti Raanta, an accomplishment he can now share with Penguins' owner Mario Lemieux who did the same 32 years earlier. On Guentzel's third shot, he scored his second goal of the game - and the final Penguin goal against the New York Rangers in the 5-2 loss. Guentzel's second goal came off of an opportunistic rebound in front of the net as Phil Kessel was centering a pass in front of Raanta. Although the Penguins lost momentum after leading by two, Guentzel showed promising offensive awareness and proficient passing abilities with his linemates throughout the game that will hopefully carry on into his next games. Guentzel played on the second line with Phil Kessel and Evgeni Malkin, and led the Penguins in shots and hits. Guentzel also ended the game with a +1, the only Penguin on the positive side of the +/- stat Monday night. Guentzel is a third round pick from 2013 and just signed a three-year entry contract with the Penguins in May. Guentzel has been a point-per-game player throughout his NCAA hockey career, as well as in his AHL career thus far. In the WBS's playoff run last season, Guentzel scored 14 points in 10 games. In the 2016-2017 season, Guentzel has scored 17 point in 16 games, and sported a +14 rating on the hottest team in the AHL. HockeysFuture.com described Jake Guentzel as, "an undersized, yet highly skilled forward who possesses a hockey IQ. The biggest knock on him has been his size, but Guentzel possesses the requisite skill, speed and grit to play a top-nine role in the NHL. He is a particularly effective player off the rush, and uses his speed and vision to create offensive plays." Guentzel's diminutive size of 5'11" and 180 lb places him just a tad bigger than Conor Sheary and a tad smaller than Bryan Rust. Guentzel's father is a long-time juniors and college coach, and this is evidenced by Guentzel's awareness of all three zones of the ice. The injury to Chris Kunitz will be an opportunity for Guentzel to make his case for a more permanent roster spot on the NHL team, and maybe put some fire on the heels of Bryan Rust, Conor Sheary, Scott Wilson and Tom Kuhnhackl. Predicting the outcome of a rookie based on one game is foolish, but Guentzel showcased what we have seen at every level he has played at: he can place shots, he knows where to be on the ice to make himself available for a scoring opportunity, and he can battle for pucks.